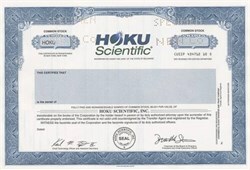 Beautifully engraved specimen certificate from Hoku Scientific . This historic document was printed by the Northern Banknote Company and has an ornate border around it with a vignette of the company logo. This item has the printed signatures of the Company’s President and Secretary. Hoku Scientific is a diversified clean energy technologies company with three business units: Hoku Materials, Hoku Solar and Hoku Fuel Cells. Hoku Materials plans to manufacture, market, and sell polysilicon for the solar market from its plant currently under construction in Pocatello, Idaho. Hoku Solar is a provider of turnkey photovoltaic systems in Hawaii. Hoku Fuel Cells has developed proprietary fuel cell membranes and membrane electrode assemblies for stationary and automotive proton exchange membrane fuel cells. History from company press release.